As a novel biodegradable material, poly (vinyl) alcohol (PVA)/starch (ST)/ glycerol (GL)/ halloysite nanotube (HNT) nanocomposite films were prepared by solution casting at the HNT contents of 0.25, 0.5, 1, 3, and 5 wt%. Water absorption capacity and water solubility of nanocomposite films were decreased remarkably by 44.24 and 48.05%, respectively, with increasing the HNT content from 0 to 5 wt% when compared with those of biopolymer matrices. Moreover, the water contact angle of nanocomposite films increased by 21.36° with the incorporation of HNTs. The presence of HNTs appeared to reduce the overall migration rates for PVA/ST/GL/HNT nanocomposite films when interacting with either hydrophilic or lipophilic food simulants. However, the migration rates of HNTs alone were enhanced with increasing the HNT content in hydrophilic, lipophilic, and acidic food simulants. On the other hand, the biodegradation rate and light transmittance of nanocomposite films were reduced linearly by 18.56 and 26.90% with increasing the HNT content from 0 to 5 wt%. Overall, novel PVA/ST/GL/HNT nanocomposite films in this study offer highly competitive materials with excellent water resistance, good biodegradability, and acceptable transparency to be potentially used for sustainable food packaging particularly targeting lipophilic and acidic foodstuffs. Petro-based polymers generally possess good mechanical, thermal and barrier properties with easy processability and relatively low cost, which makes them widely used in different industrial sectors such as construction and building, appliances, and material packaging (Siracusa et al., 2008; Sam et al., 2016; Abdullah et al., 2017). Nevertheless, it is evident that plastic wastes in ~6,300 million metric tons were generated worldwide in 2015, and if this production rate continues without effective control it will be increased up to 12,000 million metric tons of plastic wastes by 2050 (Geyer et al., 2017). Non-degradable plastic wastes can be eliminated by recycling, landfilling, and incineration resulting in high processing cost and increasing global warming (Ray and Bousmina, 2005; Shah et al., 2008). Consequently, the replacement of petro-based polymers with biopolymers becomes a suitable solution to tackle more severe environmental issues. Unfortunately, biopolymers have typical material demerits including high water/gas permeability, brittleness, and poor stability during processing as well as low heat resistance, so blending with other polymers and/or reinforcing with nanofillers can overcome these limitations (Sorrentino et al., 2007; Aslam et al., 2018). Polyvinyl alcohol (PVA) is a synthetic water-soluble biopolymer, which possesses good mechanical and thermal properties as well as good transparency and resistance to oxygen permeation. Nonetheless, it has low degradation rates in some environments such as in soil along with relatively high cost and poor water resistance owing to the presence of hydroxyl groups in repeating units of PVA (Gupta et al., 2013; Gaaz et al., 2015; Lim et al., 2015; Aslam et al., 2018). Blending PVA with starch (ST) gives rise to the high improvement of biodegradability and cost reduction (Abdullah et al., 2017). ST is a completely biodegradable polymer in soil and compost, which is abundant as a spare storage in plants with non-toxic and relatively low-cost features. However, it is hard to process due to the high brittleness and limited flexibility (Avella et al., 2005; Tang et al., 2008; Jolanta et al., 2018). It is a semicrystalline polymer consisting of amylose and amylopectin at different ratios depending on plant sources. Amylose is a linear polymer in which glucopyranosyl repeating units are linked by α(1-4) linkages while the amylopectin is the branched counterpart with α(1-4) linked backbone and α(1-6) linked branches (Avella et al., 2005, Sam et al., 2016). Plasticized PVA/ST blends have been well-utilized since 1980s (Liu et al., 1999; Tang and Alavi, 2011). Such blends belong to a widespread material system used in numerous applications such as biomedical engineering and material packaging (Tang and Alavi, 2011; Luo et al., 2012; Tanase et al., 2015; Wang et al., 2015; Zanela et al., 2015). Glycerol (GL) is one of the most popular plasticisers mixed with PVA/ST blends due to their close solubility parameters, which are 22.50, 23.40, and 21.10 MPa1/2 for PVA, ST, and GL, respectively (Rahman et al., 2010). 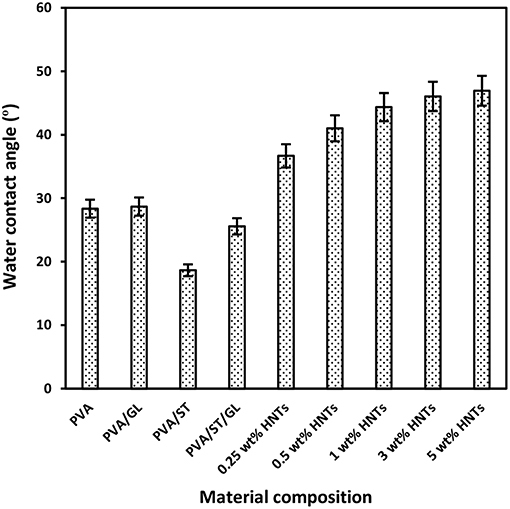 Many hydroxyl groups in Plasticized PVA/ST blends yield weak water resistance. To overcome this drawback, it is essential to reinforce such blends with applicable nanofillers to improve not only mechanical and thermal properties but also their barrier properties (Mensitieri et al., 2011; Wang et al., 2015). For instance, Tian et al. (2017) found the water absorption capacity (Wa) of plasticized PVA/ST blend films was reduced by about 20% with the inclusion of 25 wt% montmorillonite (MMT) nanoclays. Similarly, Noshirvani et al. (2016) showed that the water solubility (Ws) and water vapor permeability (WVP) of plasticized PVA/ST/Cloisite-Na+ MMT dropped by 50.81 and 16.46%, respectively, with increasing the nanofiller content from 0 to 7 wt% due to tortuous paths generated within nanocomposite films. Metal oxides can be employed to reinforce plasticized PVA/ST blends as well. For instance, nano-silicon dioxide (SiO2) was used by Tang et al. (2008) to improve mechanical properties and water resistance of plasticized PVA/ST blend films. Moreover, Akhavan et al. (2017) reported that the Wa of plasticized PVA/ST blend films was reduced by 62% with the incorporation of 0.50 wt% nano-zinc oxide (ZnO). In addition, cellulose nanocrystals (CNCs) were also used by Noshirvani et al. (2016) to reinforce plasticized PVA/ST blend films. Water resistance results demonstrated that the Ws and WVP of nanocomposites diminished by 25.19 and 4.85%, respectively, with increasing the CNC content from 0 to 7 wt%. 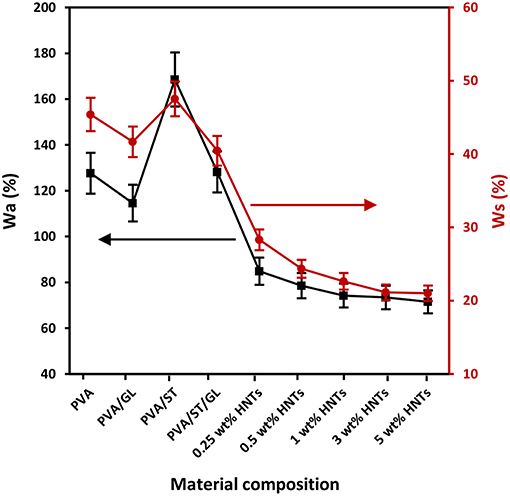 Similarly, (Guimarães et al., 2015) found that the Wa and WVP of plasticized PVA/ST/bamboo nanofibril nanocomposite films were decreased by 30 and 20%, respectively, at the nanofiller content of 6.50 wt% when compared with those of plasticized PVA/ST blend films alone. Halloysite nanotubes (HNTs) are a good nanofiller candidate to reinforce biopolymer blends because of their inherently good mechanical and thermal properties (Gaaz et al., 2017; Makaremi et al., 2017). To our best knowledge, HNTs as typical nanofillers have rarely been used to reinforce PVA/ST/GL blends despite their implementation in other bionanocomposite systems such as ST/HNT nanocomposites (Xie et al., 2011; He et al., 2012; Schmitt et al., 2015; Ren et al., 2018), PVA/HNT nanocomposites (Liu et al., 2007; Zhou et al., 2010; Qiu and Netravali, 2013; Fujii et al., 2014; Swapna et al., 2015), PVA/chitosan/HNT nanocomposites (Ali, 2016), soluble soybean polysaccharide (SSPS)/HNT nanocomposites (Alipoormazandarani et al., 2015), Pectin/HNT nanocomposites (Makaremi et al., 2017) and polylactic acid (PLA)/HNT nanocomposites (Dong et al., 2015; Castro-Aguirre et al., 2018; Chow et al., 2018). HNTs are naturally formed tubular nanoclays with a chemical formula Al2(OH)4Si2O5·nH2O. Such a hollow tubular structure for HNTs is derived from warping octahedral and tetrahedral sheets in 1:1-layer clays (also called 1:1 phyllosilicate) with a lower number of hydroxyl groups on their outer surfaces to improve the HNT dispersion within polymer matrices (Gaaz et al., 2015). As compared with other tubular morphological structures of nanofillers like carbon nanotubes (CNTs), HNTs are cheap, widely available, and easily dispersed (Tully et al., 2015; Zhang et al., 2016). Moreover, it is considered as a non-toxic material mainly used for drug delivery in medical applications (Khoo et al., 2011; Rawtani and Agrewal, 2012; Salam et al., 2015; Yuan et al., 2015), and further for food packaging applications (Biddecia et al., 2016; Makaremi et al., 2017; Lee et al., 2018). 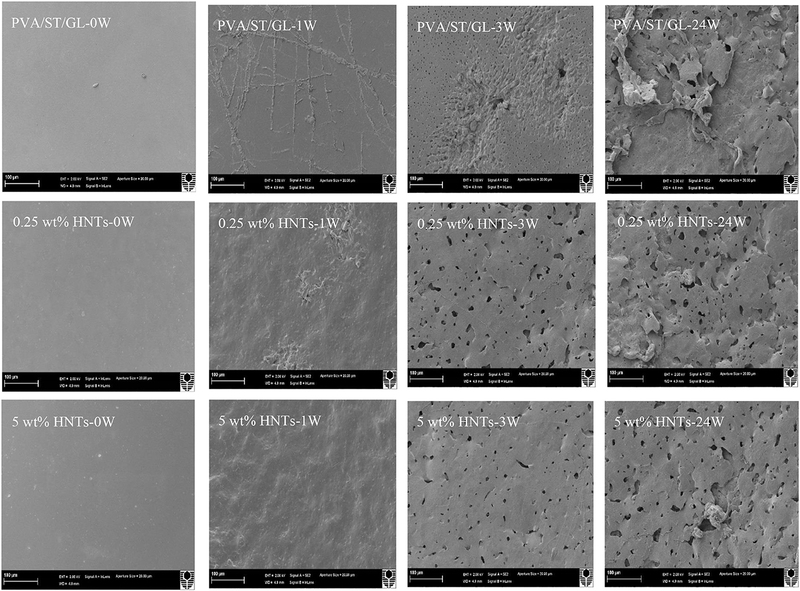 Consequently, HNTs were used in this study as natural reinforcements for sustainable PVA/ST/GL/HNT nanocomposite films to improve their water resistance such as Wa, Ws and water contact angle as their mechanical and thermal properties were improved previously (Abdullah and Dong, 2017) when compared with those of PVA/ST/GL blend matrices. When using nanocomposite materials for food packaging applications, the migration rate of nanocomposite constituents like nanofillers to foodstuffs should be seriously considered due to the food safety issue (Simon et al., 2008; Gressler et al., 2018). The overall migration rate and migration rate of nanofillers are studied widely for packaging materials based on petro-based nanocomposites such as low density polyethylene (LDPE) nanocomposites with different types of nanofillers like nanosilver (Hannon et al., 2016), nanocarbon black (Bott et al., 2014b), nanoclays (Echegoyen et al., 2016), and nanotitanium nitride (Bott et al., 2014a). PLA nanocomposites are also of a particular concern in migration studies of bionanocomposite systems reinforced with different nanofillers such as sliver-based modified MMT nanoclays (Busolo et al., 2010), Cloisite nanoclays (Schmidt et al., 2009), CNCs (Fortunati et al., 2012), multi-walled CNTs (Velichkova et al., 2017). But very limited migration studies have been investigated based on other biopolymers like PVA and ST for potential material packaging applications. Avella et al. (2005) evaluated the migration rate of MMT nanoclays from ST/ 4 wt% MMT nanocomposite films in contact with lettuce and spinach. In a similar manner, Mauricio-Iglesias et al. (2010) found different quantities of aluminum ions (Al+) and silicon ions (Si+) in food simulants owing to the migration of MMT nanoclays from wheat-gluten/MMT nanocomposite films. Whereas, Cano et al. (2015b) concluded that the overall migration rate of PVA/ST/CNC nanocomposite films was increased by 26.08% with increasing the CNC content from 0 to 5 wt% in 10% ethanol simulant. Nonetheless, the overall migration rate was decreased by 66.67% in the isooctane simulant with increasing the CNC content from 0 to 5 wt%. According to the Sustainable Packaging Coalition (2011) and Magnier and Crié (2015), the sustainable packaging should meet the following criteria: (i) useful, safe and healthy for individuals and communities throughout its life cycle, (ii) gathering market requirements for performance and cost, (iii) using renewable energy for manufacturing, transporting, and recycling, (iv) using renewable or recycled source materials, (v) using clean production technologies, (vi) made from materials healthy throughout their life cycle, (vii) designed to improve materials and energy, and (viii) effectively recovered and utilized in industrial/biological closed loop cycles. In this study, PVA, ST, and HNTs were selected as renewable materials for manufacturing nanocomposite films using solution casting as a clean production technology to meet the stringent criteria for sustainable packaging. Moreover, PVA/ST/GL/HNT nanocomposite films were characterized to investigate the effect of HNT contents on water resistance, transparency and biodegradability to study their material performance. The overall migration rates and HNT migration rates were explicitly investigated as well for PVA/ST/GL/HNT nanocomposite films with different food simulants mimicking hydrophilic, lipophilic, and acidic foodstuff conditions to evaluate their impact on critical food safety. PVA (molecular weight: 89,000–98,000 g/mol and hydrolysis degree: 99%), soluble ST from potatoes (100% concentration), GL solution (molecular weight: 92.09 g/mol and 60–100% concentration), and nitric acid with 70% concentration were purchased from Sigma-Aldrich Pty. Ltd, Australia. Furthermore, HNTs were donated by Imerys Tableware Asia Ltd, New Zealand in form of as-received ultrafine particles with a relative density of 2.53 g/cm3. Glacial acetic acid with 96% concentration was supplied by Merck Pty. Ltd, Australia. Ethanol with 100% concentration was provided by Rowe Scientific Pty. Ltd, Australia. Aluminum standard solution with the concentration of 1,000 mg/L in nitric acid was provided by ThermoFisher Scientific Pty. Ltd, Australia. Silicon standard solution also with the same concentration in nitric acid was purchased from High-Purity Standards, Inc. All materials were used as received without further modifications. Solution casting method was employed to fabricate neat PVA, PVA blends (i.e., PVA/GL, PVA/ST, PVA/ST/GL), and PVA/ST/GL/HNT nanocomposite films. An aqueous solution of 5 wt%/v PVA was obtained by dissolving 10 g PVA powders in 190 ml deionised water at 35°C to prepare neat PVA films. The solution was gradually heated up to 85°C with continuous stirring via an IKA®- RCT basic magnetic stirrer at 500 rpm for 3 h. Equal amounts of clear PVA solutions were poured into petri dishes (dish diameter: 15 cm) to produce thin films with uniform thickness of 0.110–0.125 mm. Then these films were subsequently dried at 50°C for 24 h. PVA/GL blends were also fabricated using the same procedure with the addition of 30 wt% GL as a plasticizer during the last 30 min in the fabrication process. PVA/ST aqueous solution at the blend ratio of 80/20 was prepared by mixing 8 g PVA and 2 g ST at room temperature in powder form, which was followed by dissolving them in 190 ml deionised water according to the same procedure mentioned earlier. PVA/ST blends were also plasticized with 30 wt% GL to fabricate PVA/ST/GL blends as final biopolymer matrices for corresponding nanocomposites. HNTs at different nanofiller contents of 0.25, 0.50, 1, 3, and 5 wt% were mechanically mixed using an IKA®- RW20 stirrer with 100 ml deionised water at 50°C and 500 rpm for 2 h to prepare the HNT aqueous suspension. Subsequently, the HNT suspension was sonicated using an ultrasonicating bath ELMA Ti-H-5 model at 50°C for 1 h with the frequency of 25 kHz and power intensity of 90%. The HNTs suspension was added in a dropwise manner to 100 ml PVA/ST/GL blend solution at 50°C and 500 rpm with the aid of mechanical stirring for 30 min. Finally, the prepared mixture solution was further homogenized via a magnetic stirrer at 50°C and 350 rpm for 30 min. The sonication process continued for extra 30 min in the same conditions to remove any entrapped air bubbles. Neat PVA, PVA blends, and PVA/ST/GL/HNT nanocomposite films were stored in a desiccator to dry all materials for at least 1 week prior to the following experimental characterization. Water contact angles of neat PVA, PVA blends and PVA/ST/GL/HNT nanocomposite films were determined by using a Tensiometer KSV-CAM 101 (KSV Instruments Ltd., Finland). The surface hydrophilicity of films was evaluated by dropping 2 μL deionised water on their flat surfaces using a Sessile Drop Half-AngleTM Tangent line method (Sadegh-Hassani and Nafchi, 2014; Alipoormazandarani et al., 2015). At least five droplets at random places of different samples for each material batch were reported for test reliability. The light transmittance of all materials was measured in a range of 200–800 nm on an ultraviolet-visible (UV-vis) spectrometer (Jasco-V670) with a blank glass plate being used as a reference. Light transmittance (T%) of film samples, three samples per material batch, was determined with a scan rate of 200 nm/min. The migration rates of nanocomposite films were investigated according to (European Union Commission Regulation (EU) No. 10, 2011). In this study, three different food simulants, namely 10% (v/v) ethanol solution (simulant A), 50% (v/v) ethanol solution (simulant D1), and 3% (w/v) acetic solution (simulant B) were employed to mimic hydrophilic, lipophilic and acidic foodstuff conditions, respectively. Approximately 1 dm2 PVA/ST/GL blend films and their corresponding nanocomposite films with different HNT contents were immersed in individual glass bottles filled with 100 ml food simulant solutions, as recommended by The European Standard EN. (2002). Glass bottles were tightened and then kept in the oven at 40°C for 10 days. Six samples were selected for each food simulant, in which initial three samples were used to calculate overall migration rates and the other three samples were particularly employed for migration rates of nanofillers. After 10 days, the bottles were removed from the oven, and then cooled down to room temperature before opening to reduce the evaporation of food simulants. All samples were removed from food simulants gently. The food simulants of initial three samples were evaporated, and the residues were dried overnight at 105°C, which were then weighed after cooling down to room temperature with an analytical balance (±0.0001 g precision) to calculate the overall migration rates in mg/kg. Associated results were well compared with overall migration limit (OML) of 60 mg/kg (European Union Commission Regulation (EU) No 10/2011). Inductivity coupled plasma-optical emission spectroscopy (ICP-OES) (PerkinElmer-Optima 8300) was implemented to evaluate the migration rates of Al+ and Si+ as a clear indication for the HNT migration from nanocomposite films. As a result, the residues for the other three samples were digested after being dried by using 15 ml HNO3 (solution concentration: 3%) at 95°C for 2.5 h. The digestion process was used to convert the residues of elements to an ionic state, and meanwhile to diminish the effect of matrices and reduce the contamination of equipment with dust. The operation parameters of ICP-OES were listed in Table 1. For ICP-OES calibration, two blank solutions (i.e., distilled water and 3% nitric acid) and three standard solutions were used. Each standard solution contained an equal concentration of both Al+ and Si+. They were prepared by a serial dilution of stock standard solutions with the same concentration of 1,000 mg/L for both Al+ and Si+, which were further diluted to 1, 5, and 10 mg/L for Al+ and Si+. Table 1. ICP-OES operating parameters for nanofiller migration tests. Three samples for each batch were used for test reproducibility. The surface morphology of neat PVA, PVA blends and PVA/ST/GL/HNT nanocomposite films were examined before, during, and after soil burial degradation tests by using a NEON-40EsB field emission scanning electron microscope (FE-SEM) at an accelerating voltage of 2 kV. All samples were fixed on aluminum stubs and coated with platinum layer (layer thickness: 3 nm) to improve the contrast of material constituents. Since most biopolymers have the high sensitivity to water, the study of Wa parameter is essential particularly in relation to food packaging applications (Sadegh-Hassani and Nafchi, 2014; Aloui et al., 2016). The addition of 30 wt% GL tended to moderately decrease the Wa from 127.61% for PVA alone to 114.58% for PVA/GL blends, which could be associated with the strong interaction between PVA and GL resulting in the consumption of free hydroxyl groups of PVA in good agreement with Follain et al. (2005). On the other hand, as illustrated in Figure 1, one could see that PVA/ST blends had the highest Wa, which was ascribed to partial constituent miscibility with many free sites being occupied by water molecules. As expected, high hydrophilicity of starch with good water absorption inevitably yielded the increase in Wa for PVA/ST blends (Ali, 2016), which was believed to be associated with typical hygroscopic nature of starch (Azahari et al., 2011; Ismail and Zaaba, 2011; Salleh et al., 2017). It was implied that the equilibrium with the environment could be reached by water gain and loss. Nonetheless, the GL plasticization effect in PVA/ST/GL blends gave rise to much lower Wa, which may benefit from its improvement of phase miscibility and constituent interactions, as evidenced by Zou et al. (2008) to conclude that the presence of GL improved the compatibility between PVA and ST and reduced the Wa. Figure 1. Water absorption capacity (Wa) and water solubility (Ws) of neat PVA, PVA blends, and PVA/ST/GL/HNT nanocomposites at different HNT contents. The incorporation of HNTs in PVA/ST/GL/HNT nanocomposites further reduced the Wa when compared with that of PVA/ST/GL blends, which could be explained by a typical reduction for water diffusion in the presence of HNTs within their morphological structures (Sadegh-Hassani and Nafchi, 2014). A drastic decrease in Wa from 128.23 to 74.23% was attributed to the fact that embedded HNTs generated tortuous paths to hinder the water diffusion when the HNT content was increased from 0 to 1 wt%. Similar effect of HNTs was reported on chitosan/HNT nanocomposites and chitosan/clove essential oil (CEO)/HNT nanocomposites by Lee et al. (2018). Their results showed that the Wa of chitosan/HNT nanocomposites and chitosan/CEO/HNT nanocomposites was reduced by 42.17 and 43.31%, respectively, at the HNT content of 30 wt% as opposed to those of corresponding matrices due to the incorporation of nanofillers to affect the water absorption of matrices. Moreover, Abbasi (2012) stated that the Wa of plasticized PVA/ST blend films significantly diminished by 50% with increasing the nano-SiO2 content from 1 to 5 wt% owing to highly active physical interaction between nanofillers and blend matrices to lower the number of hydroxyl groups in nanocomposite films. However, as illustrated in Figure 1, the Wa appeared to show a minor reduction up to 3.69% beyond 1 wt% HNTs. This phenomenon arose from the HNT agglomeration mentioned in our previous work (Abdullah and Dong, 2017). The above-mentioned findings obtained in this study were also consistent with relevant results in plasticized PVA/ST/MMT nanocomposite films (Taghizdeh et al., 2012; Tian et al., 2017) as well as plasticized PVA/ST/nano-SiO2 nanocomposite films (Tang et al., 2008). Overall, the reduction of Wa in nanocomposite films could be determined based upon nanofiller content and nanofiller dispersion within polymer matrices. The Ws values of neat PVA, PVA blends and PVA/ST/GL/HNT nanocomposites were also demonstrated in Figure 1. In general, when material films have high Wa, they tend to easily dissolve in water as well because water molecules are absorbed onto hydroxyl groups particularly with hydrogen bonding to make the films easier to dissolve (Azahari et al., 2011). As such, Wa and Ws of all film materials possessed a very similar overall trend despite different magnitudes of parameters, as observed in Figure 1. The high values of Ws were accepted because all the constituents had hydrophilic nature including PVA, ST, and GL, which was consistent with other studies (Cano et al., 2015a; Zanela et al., 2015). The Wsof neat PVA was decreased by 8.21% when blended with GL to decrease the number of free hydroxyl groups interacting with water molecules. PVA/ST blends yielded the highest Ws among all film materials resulting from the high water affinity of constituents according to the studies carried out by Negim et al. (2014). On the other hand, the Wsof PVA/ST/GL blends was found to be reduced by 14.89% due to the presence of GL as a plasticizer to increase the miscibility between PVA and ST with better interfacial bonding (Zanela et al., 2015; Cano et al., 2015a). The incorporation of HNTs to PVA/ST/GL blend films appeared to reduce the Ws in a monotonically decreasing manner from 40.45 to 21.10% with increasing the HNT content from 0 to 5 wt% accordingly. This finding may be associated with the hydrophobic nature of HNTs resulting from a low number of hydroxyl groups on HNT surfaces (Liu et al., 2014). Moreover, SiO2 groups in HNTs had the ability to form strong hydrogen bonds by consuming free hydroxyl groups of polymer matrices and reduce the number of interaction sites with water molecules (Sadegh-Hassani and Nafchi, 2014). The Ws reduction was more pronounced when the HNT content was in range of 0.25–1 wt% as shown in Figure 1, because of good HNT dispersion within blend matrices in nanocomposite films. Whereas, such a decrease tendency became insignificant in range from 22.64 to 21.10% when increasing the HNT content from 1 to 5 wt% owing to the same HNT agglomeration issue mentioned in previous Wa results. Our finding was in good accordance with those in plasticized PVA/ST/nano-SiO2 nanocomposites (Tang et al., 2008) and plasticized PVA/ST/CaCO3 nanocomposites (Kisku et al., 2014). Water contact angle of neat PVA, PVA blends, and PVA/ST/GL/HNT nanocomposites were measured in order to evaluate the hydrophilic nature of all material surfaces. It is well-known that low water contact angles <90° is referred to as the high material wettability whilst high contact angles >90° correspond to low wettability instead (Yuan and Lee, 2013). In other words, low water contact angles could signify higher hydrophilic nature of material surfaces and vice versa (Sadegh-Hassani and Nafchi, 2014, Alipoormazandarani et al., 2015). Apparently, neat PVA, which is considered as a popular water-soluble polymer, had a very low water contact angle of 28.35° in good agreement with the previous result (Lim et al., 2015). The addition of GL to PVA only slightly increased the water contact angle for PVA/GL blend films by 0.33°C, which could be interpreted by their insignificant reductions in Wa and Ws. Moreover, with the incorporation of ST, the hydrophilic level of PVA/ST blend films was further improved, as evidenced by a decrease in water contact angle by 9.70° compared with that of neat PVA counterpart, as illustrated in Figure 2. Moreover, an angle reduction of 2.78°C was reported for PVA/ST/GL blend films as opposed to that of neat PVA counterpart. The remarkable hydrophilic improvement for PVA blends, when compared with that of neat PVA, could be associated with more hydroxyl groups existing in PVA blends with the addition of ST. Such a finding further coincided with the increases in Wa and Ws of PVA blend films as compared to those of neat PVA. Figure 2. Water contact angles of neat PVA, PVA blends, and PVA/ST/GL/HNT nanocomposite films at different HNT contents. Where θm and θ are the measured and ideal contact angles, respectively, which can be calculated from perfect smooth surface like mirror, and r is the roughness ratio where r = 1 for smooth surfaces and r>1 for rough surfaces (Kubiak et al., 2011). Similarly, Biddecia et al. (2016) found the water contact angle of pectin/modified HNT nanocomposite film surfaces was increased by 6°C as compared with that of neat pectin matrices due to increasing the surface roughness of nanocomposite films with the addition of HNTs. PVA/ST/GL/HNT nanocomposite films were still within the hydrophilic-material range though their water contact angle was increased up to 21.57°C compared with that of PVA/ST/GL blends. The increased water contact angles for nanocomposite films were correlated well with corresponding reductions in their Wa and Ws, with increasing the HNT contents. One of important features in food packaging for consideration is the film transparency in terms of light transmittance (T%). 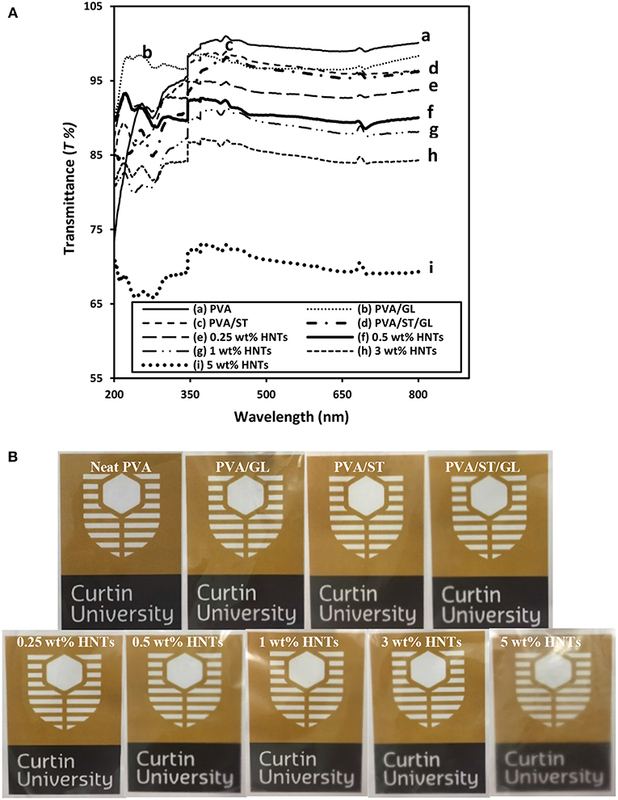 Typical light transmittance curves for neat PVA, PVA blends and PVA/ST/GL/HNT nanocomposites as well as respective digital images of Curtin University logo observed through each of film batches were displayed in Figures 3A,B, respectively. Figure 3. (A) UV-vis spectra curves, and (B) digital images for the film transparency of neat PVA, PVA blends, and PVA/ST/GL/HNT nanocomposites at different HNT contents. Neat PVA in possession of high crystallinity led to relatively high T% in range of 99–100.0%, which was close to previously determined results elsewhere (Gupta et al., 2013). Depending on the phase miscibility, PVA/ST/GL had a slightly reduced T% of 95.76–98.72%, which was believed to be induced by the incident light loss from the light transmission, scattering, absorption, reflection and refraction when striking an interface while such a loss was increased especially at interfacial areas (Cai et al., 2016). Regardless of different wavelengths used, nanocomposite films yielded a significant decrease in T% when the HNT content was increased from 0 to 5 wt%, which was mostly pronounced at the higher content level of 5 wt%. Apparently, nanocomposite films with higher HNT contents inevitably led to higher surface roughness due to the inclusion of highly agglomerated nanofillers resulting in increased light scattering sites (Grunlan et al., 2003), as also confirmed by other studies in plasticized PVA/ST nanocomposite films (Tang et al., 2008, Akhavan et al., 2017). On the other hand, Lee et al. (2018) considered this reduction of T% as an advantage for food packaging applications since the UV-barrier properties of chitosan/CEO/HNT nanocomposite films could be improved leading to better protection of foodstuffs against nutrient loss, decolonization and lipid oxidation. 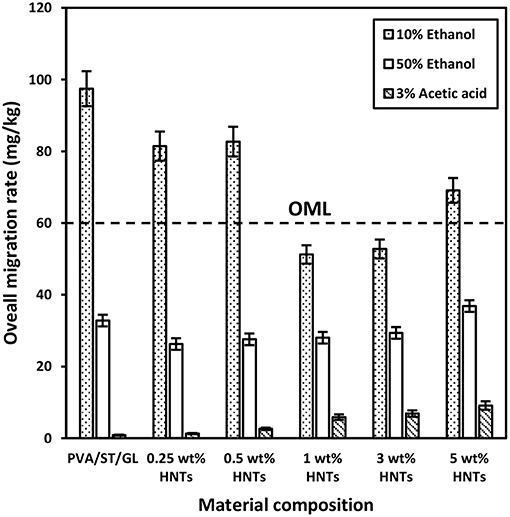 The overall migration rates in three different food simulants, namely 10% ethanol (simulant A), 50% ethanol (simulant D1), and 3% acetic acid (simulant B) were presented in Figure 4, which represented typical hydrophilic, lipophilic and acidic foodstuffs. It was evident that overall migration rates seemed to be much higher in PVA/ST/GL blends especially when contacting with simulant A as opposed to those of nanocomposite films, which stemmed from water soluble characteristic of PVA, ST and GL constituents in their blends (Mauricio-Iglesias et al., 2010). The overall migration rate of PVA/ST/GL blend and their nanocomposite films exceeded the OML of 60 mg/kg in food simulant A except those nanocomposites at HNT contents of 1 and 3 wt%, which could be applicable to safe food packaging. The hydrophilic nature of PVA/ST/GL blends and their nanocomposite films could improve their solubility in any hydrophilic solution like food simulant A. It was easily understood that with the addition of HNTs as hydrophobic nanofillers, the solubility of PVA/ST/GL blend matrices could diminish as earlier mentioned. On the other hand, strong interfacial bonding between HNTs and blend matrices was another plausible reason to reduce the mass transfer while in contact with food simulants. Therefore, it was clearly indicated that optimal HNT contents of 1 and 3 wt% had significant impact on the remarkable reductions of overall migration rates by 47.41 and 45.85% in food simulant A, respectively, as opposed to that of PVA/ST/GL blends. Notwithstanding that the overall migration rate of nanocomposite films with the inclusion of 5 wt% HNTs was increased again by 30.97% possibly due to the HNT agglomeration, it was still lower than those of PVA/ST/GL blends and nanocomposites at the HNT contents of 0.25 and 0.50 wt%. Such a finding was further proven by Cano et al. (2015b), when dealing with PVA/ST/CNC nanocomposite films. With respect to simulant D1, overall migration rates of both PVA/ST/GL blends and nanocomposites were unanimously well below the OML of 60 mg/kg. The overall migration rates of nanocomposites were decreased at HNT contents of 0.25–3 wt% relative to that of PVA/ST/GL matrices and the maximum reduction by 19.93% was recorded at the lowest HNT content of 0.25 wt%. Finally, the lowest overall migration rates were recorded in food simulant B to mimic acidic foodstuffs at the pH level below 4.50. There was a clear modestly increasing trend for overall migration rates of nanocomposites from 1.29 to 9.13 mg/kg when increasing the HNT content from 0 to 5 wt%. The overall migration rates of PVA/ST/GL/HNT nanocomposites were highly influenced by the selection of food simulants in which they possessed a higher sensitivity to hydrophilic foodstuffs, followed by lipophilic foodstuffs and then acidic foodstuffs with the least impact. In view of safe food packaging, all polymer blend and nanocomposite films were satisfied with the OML criterion to be used for lipophilic and acidic foodstuff packaging while only nanocomposite films at the HNT contents of 1–3 wt% were suitable for hydrophilic foodstuffs. Figure 4. Overall migration rates of PVA/ST/GL blends and PVA/ST/GL/HNT nanocomposites in three different food simulants. The HNT migration was evaluated by detecting the presence of Al+ and Si+ in migrated materials. There were no traces of Al+ and Si+ detected in migrated materials from PVA/ST/GL blend films. In other words, the overall migration rate of such polymer blend films clearly reflected the quantities of migrated polymeric molecules to different food simulants. On the other hand, different quantities of Al+ and Si+ were found in all migrated materials based on nanocomposite films, as shown in Figures 5A,B, respectively. The migration rates of both Al+ and Si+ were in good agreement with the overall migration rates in different food simulants. That means higher quantities of Al+ and Si+ were detected in food simulant A, which was followed by food simulant D1 along with their lowest quantities in food simulant B. Such a finding could be due to the hydrophilic nature of food simulant A, which worked as solvent-like water on nanocomposite films resulting in increasing the chain mobility of polymeric molecules and improving the release of nanofillers from nanocomposite films. Lee et al. (2018) discussed similar results based on the migration of CEO in chitosan/CEO films and chitosan/CEO/HNT nanocomposite films by migrating simulant molecules from external surfaces of the films to internal film structures, which resulted in weak and lost bonding networks between film constituents. As such, active agents trapped by continuous polymer matrices could be easily released, particularly when polymeric molecules were soluble in simulants. The amounts of migrated Al+ and Si+ in food simulant A were increased by 766.67 and 424.82% with increasing the HNT content from 0.25 to 5 wt%, respectively, which was followed by 381.82 and 202.87% in simulant D1 as well as 162.79 and 290.38% in simulant B accordingly. Once again, food simulant B had the weakest interaction with nanocomposite films especially for migrated Al+ related to the inert nature of Al element to acidic foodstuffs, and this finding was consistent with the overall migration rate results mentioned earlier. Such phenomenal results may be interpreted by two different mechanisms of diffusion for the penetration of food simulants in nanocomposite films, and embedding to represent intermolecular forces between penetrated molecules and film materials according to the dual sorption theory (Huang et al., 2011; Farhoodi et al., 2014). Since the diffusion process could be much faster than embedding counterpart, the diffusion of hydrophilic molecules in PVA/ST/GL/HNT nanocomposite films further enlarged interconnecting spaces between polymeric chains to better facilitate the HNT release from nanocomposite films. As such, fast diffusion in film materials played a leading role in controlling migration rates, which tended to be much higher in hydrophilic foodstuffs as opposed to those in lipophilic and acidic counterparts. Figure 5. Migration rates of (A) Al+ and (B) Si+ obtained from PVA/ST/GL blends and PVA/ST/GL/HNT nanocomposites in three different food simulants. According to European Union Commission Regulation (EU) No. 10 (2011), there was no specific migration limits for Al+ and Si+ that could be followed for comparison. However, HNTs were classified as a natural, biocompatible, non-toxic and EPA 4A listed material (Kamble et al., 2012; Kryuchkova et al., 2016; Lvov et al., 2016). Consequently, HNTs were widely used for medical applications such as drug delivery particularly for non-injectable drug formula, bone cement, dentist resin, tissue scaffolds, cosmetics, and antiseptic treatment of hospitals (Kamble et al., 2012; Lvov et al., 2016; Fizir et al., 2018). Numerous studies were carried out on the toxicity of HNTs by the in-vitro and in-vivo experiments. Their results showed that HNTs did not possess the toxicity up to a concentration of 75 μg/mL and about 90% of tested cells were still viable (Vergaro et al., 2010; Fizir et al., 2018; Santos et al., 2018). Whereas, other studies further extended such a concentration to 100 μg/mL (Lvov et al., 2016), and 200 μg/mL (Guo et al., 2012). As such, the migrated amounts of HNTs from PVA/ST/GL/HNT nanocomposite films were well within the safe limits (based on the part per million (ppm) as a scale for comparison) without any toxic effect on the nanoparticle intake by human bodies. Overall, no great difference was shown between the quantities of Al+ and Si+ migrated in each food simulant as a result of similar element contents of Al (20.90%) and Si (21.76%) detected in the HNT composition (Abdullah et al., 2017). It was expected that increasing the HNT content from 0.25 to 5 wt% inevitably enhanced the quantities of Al+ and Si+ despite various increasing levels depending on the use of three different food simulants. The consistently highest quantities of migrated Al+ and Si+ with the inclusion of 5 wt% HNTs in nanocomposite films might also be described by the detrimental effect of nanofiller agglomeration at high HNT content levels to induce their poor interfacial bonding with blend matrices (Abdullah and Dong, 2017) when compared with well-dispersed HNTs at the low contents, as shown in Figure 6. Consequently, the release of highly agglomerated HNTs to food simulants appeared to be much easier than those well-dispersed HNTs embedded in matrices in nanocomposite films. Figure 6. Schematic diagram of released HNTs from PVA/ST/GL/HNT nanocomposite films in a typical food simulant based on (A) well-dispersed HNTs at low nanofiller contents and (B) agglomerated HNTs at high nanofiller contents. The biodegradability of most biopolymers was highly related to the Wa and Ws since their degradation was initiated with the water absorption on their surfaces, and then followed by the growth of microorganism like bacteria and fungi. On the other hand, high material solubility also accelerated the biodegradability, which was particularly the case in soil (Guohua et al., 2006; Zanela et al., 2015). The digital images of films before and after 24-week biodegradation tests clearly indicated that PVA/ST, PVA/ST/GL blends and PVA/ST/GL/HNT nanocomposite films diminished in size and intended to become more fragile and wrinkling films, as depicted in Figure 7A. Neat PVA and PVA/GL blend films possessed relatively good transparency after biodegradation tests. Whereas, PVA/ST, PVA/ST/GL blends and PVA/ST/GL/HNT nanocomposite films tended to undergo a great color change and become more yellowish after biodegradation tests. This phenomenon could be associated with the presence of potato-based soluble ST prone to the strong attack by microorganism when compared with the former PVA and PVA/GL blends (Hejri et al., 2013). Figure 7. 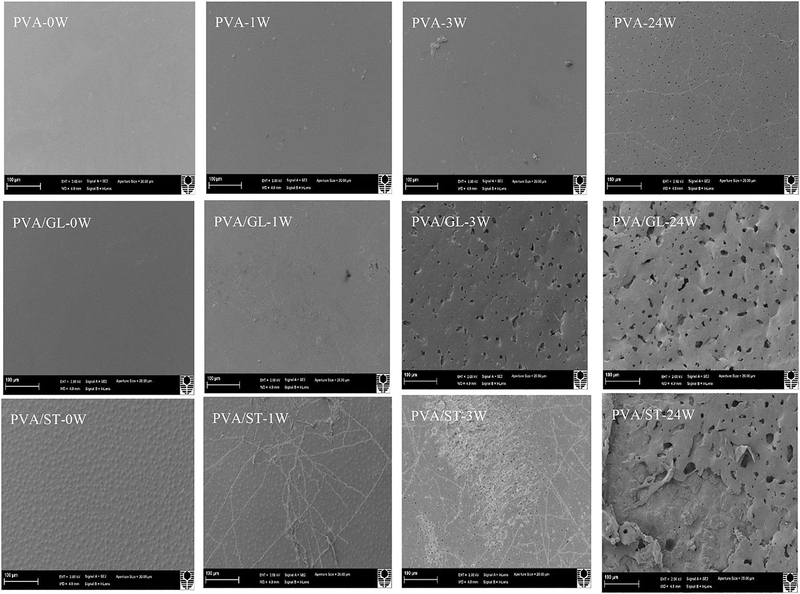 (A) Digital images before and after biodegradation tests, and (B) biodegradation rates of neat PVA, PVA blend and PVA/ST/GL/HNT nanocomposite films. Biodegradation rates of neat PVA, PVA blends and PVA/ST/GL/HNT nanocomposites were evaluated as a function of time over 24-week periods, as shown in Figure 7B, which could be clearly divided into an “active-state period” in the initial 3 weeks where most materials degraded in very rapid pace as well as “steady-state period” for the rest of time at a relatively slow rate until the end of tests, as confirmed by other studies (Guohua et al., 2006; Hejri et al., 2013; Singha and Kapoor, 2014). Azahari et al. (2011) stated that such a phenomenon could take place in soil and compost degradation due to the composting process including active composting and curing stages. In the active stage, a strong microbial activity happened due to rising temperatures resulting from oxygen availability. In comparison, as the temperature decreased in the curing stage, the degradation process continued with a relatively slow rate. Neat PVA films possessed the lowest biodegradation rate of 5.87% among all materials after 24 weeks in this study, which suggested that PVA had high resistance to biodegradation in soil, and this slight weight loss was associated with its typical characteristic of hydrolysability (Imam et al., 2005; Guohua et al., 2006; Kopcilova et al., 2013). Normally, carbon backbone polymers like PVA are not susceptive to biodegradation (Kale et al., 2007). However, polymeric chains of PVA were cleaved, decreased in molecular weight and finally consumed by microorganisms due to the enzymatic oxidation of hydroxyl and carbonyl groups, which was then followed by the hydrolysis of these groups (Kale et al., 2007). Nonetheless, blending GL with PVA in film materials was found to increase their biodegradation rate up to 23.33% because it increased the chain mobility of PVA molecules with the further improvement of water diffusion through their morphological structures. Moreover, the addition of ST, when considered as a fully biodegradable polymer (Guohua et al., 2006; Azahari et al., 2011), inevitably further increased the biodegradation rate up to 39.54%, which was attributed to easier microorganism attack to ST material structures than those of neat PVA (Hejri et al., 2013, Kale et al., 2007). It was well reported that increasing the ST content could improve the biodegradation rate of PVA/ST blends in a linear manner (Jayasekara et al., 2003; Azahari et al., 2011; Tanase et al., 2015). With respect to the biodegradability of nanocomposite films, it was manifested that their biodegradation rate dropped linearly from 56.94 to 41.28% with increasing the HNT content from 0 to 1 wt%, which directly benefited from the formation of hydrogen bonds between well-dispersed HNTs and blend matrices so that water diffusion, mass transfer and infiltration speed of microorganisms were restricted (Tang et al., 2008). At the HNT contents of 3 and 5 wt%, the biodegradation rates were modestly increased to 45 and 45.80%, respectively, due to the agglomeration of HNTs, which were still more significant when compared with that of neat PVA, in good agreement with other results (Imam et al., 2005; Tang et al., 2008; Heidarian et al., 2017). Neat PVA, PVA blends and PVA/ST/GL/HNT nanocomposites were also examined via SEM analysis to understand structural damage due to soil burial degradation over different time periods, namely at initial week (0 W), during the active-state periods after 1 week (1 W) and 3 weeks (3 W) as well as at the end of the degradation tests (i.e., after 24 W), as shown in Figures 8, 9. Only morphological structures of nanocomposite films reinforced with 0.25 and 5 wt% were demonstrated as two typical cases for low and high HNT contents. As seen in Figure 8, neat PVA and PVA/GL blend films revealed similar smooth surface morphology as reported elsewhere (Cano et al., 2015b,c), which was completely different from a multitude of globular structures with much higher surface roughness for PVA/ST blends. The latter observation was related to the incompatibility between PVA and ST as two separate constituents in blend films with the absence of plasticizers such as GL, which was in good agreement with Cano et al. (2015c). Such partial phase miscibility effect in PVA/ST blends in this study was believed to cause their higher Wa and Ws. It was also interesting to note that smooth surface morphology took place in PVA/ST/GL blend films instead mainly because better compatibility between PVA and ST could be obtained in the presence of GL with their resulting slight reductions of Wa and Ws when compared with those of PVA/ST blend films. The addition of HNTs also increased the surface roughness of nanocomposite films particularly with the inclusion of 5 wt% HNTs in comparison with that of PVA/ST/GL blend films, as depicted in Figure 9. Figure 8. SEM micrographs of neat PVA, PVA/GL blend and PVA/ST blend films at initial week (0 W), after 1 week (1 W), 3 weeks (3 W), and 24 weeks (24 W) in soil burial degradation tests. All scale bars represent 100 μm. Figure 9. SEM micrographs of PVA/ST/GL blend and PVA/ST/GL/HNT nanocomposite films at the HNT contents of 0.25 and 5 wt% at initial week (0 W), after 1week (1 W), 3 weeks (3 W), and 24 weeks (24 W) in soil burial degradation tests. All scale bars represent 100 μm. In particular, neat PVA films did not show clear surface changes during the testing periods, as confirmed with the film appearance in Figure 8. “Branched traces” could be found slightly on the surfaces of PVA/GL blend films, but more clearly observed on the surfaces of PVA/ST blend films and PVA/ST/GL blend films, which are known as “fungal hyphae.” According to Qiu and Netravali (2015) these fungal hyphae could be commonly generated during the biodegradation process at a suitable temperature level. The number and extension of these fungal hyphae increased with time by crossing each other to form grooves, as indicated elsewhere (Sang et al., 2002). The presence of fungal hyphae could be associated with high degradation rates during the first weeks of active-state periods. Nanocomposite films had rough surfaces after 1 week, but the HNTs prevented the formation of these fungal hyphae because the presence of nanofillers reduced the infiltration speed of microorganisms in good accordance with Tang et al. (2008). Neat PVA films possessed much rougher surfaces after 3 weeks while PVA/GL blend films demonstrated considerable changes such as the formation of pores with average pore diameters in range of 0.12–1.64 μm. The presence of GL assisted in the chain-mobility improvement of polymeric molecules (Talja et al., 2007; Ismail and Zaaba, 2011), further increased the infiltration speed of microorganisms within blend films, and in turn enhanced the biodegradation rate when compared with that of neat PVA counterparts. The degradation process induced by fungal hyphae was much faster in PVA/ST blend films and PVA/ST/GL blend films than that in neat PVA films along with the existence of many small open pores in some surface areas (Negim et al., 2014). Nanocomposite films revealed a relatively small number of pores as compared with PVA/ST/GL blend films despite their bigger average pore diameters in range of 0.21–3.05 μm. After 24 weeks, fine porous structures were manifested for the surface morphology of neat PVA films with average pore diameters in range of 0.06–0.72 μm, which were more or less uniformly distributed around PVA film surfaces with low degradation rates. Nonetheless, surface morphological structures of PVA/ST and PVA/ST/GL blends as well as PVA/ST/GL/HNT nanocomposites were observed to deteriorate progressively from film external surfaces to their internal layers. Finally, the presence of ST had remarkable effect on morphological structures of PVA/ST, PVA/ST/GL, and nanocomposite films as opposed to those of neat PVA films. Biopolymers were widely used to reduce plastic wastes for environmental sustainability. PVA has been considered as one of attractive synthetic biopolymers over a few decades. PVA was blended with ST and GL to improve its biodegradability and compatibility whilst reduce material cost. PVA/ST/GL blend films had poor water resistance because all the components belonged to hydrophilic materials. The incorporation of HNTs improved the water resistance of PVA/ST/GL/HNT nanocomposite films by reducing the Wa and Ws by 44.24 and 48.05%, respectively, with increasing HNT contents from 0 to 5 wt%. The relatively hydrophobic nature of HNTs in addition to the generation of hydrogen bonds between polymeric matrices and nanofillers could restrict the diffusion of water molecules through polymer matrices. These findings were evidenced by decreasing the hydrophilic nature of nanocomposite films with the incorporation of HNTs, which was reflected by increasing the water contact angle of nanocomposite films by 21.36°C when compared with that of PVA/ST/GL blend films. Small HNT contents between 0.25 and 1 wt% had higher influence on the improvement of water resistance due to good HNT dispersion compared with typical HNT agglomeration at high nanofiller content levels beyond 1 wt%, thus resulting in the reduction of tortuous effect for water diffusivity. The use of PVA/ST/GL/HNT nanocomposite films still demonstrated the good transparency at an acceptable level despite its reduction from 96.23 to 70.48% when the HNT content was increased from 0 to 5 wt% at the wavelength of 550 nm. 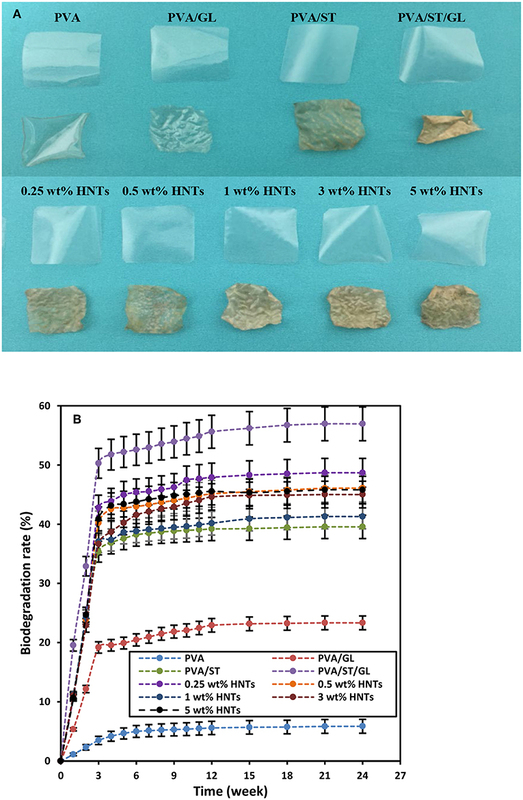 The similar trend was also observed with respect to the biodegradation rate of such nanocomposite films decreasing from 56.94 to 41.28% with increasing the HNT contents from 0 to 1 wt% where HNTs were well-dispersed. This result is in contrast with a further increase up to 45.80% with the inclusion of 5 wt% highly agglomerated HNTs despite being still higher than that of PVA/ST blend films. 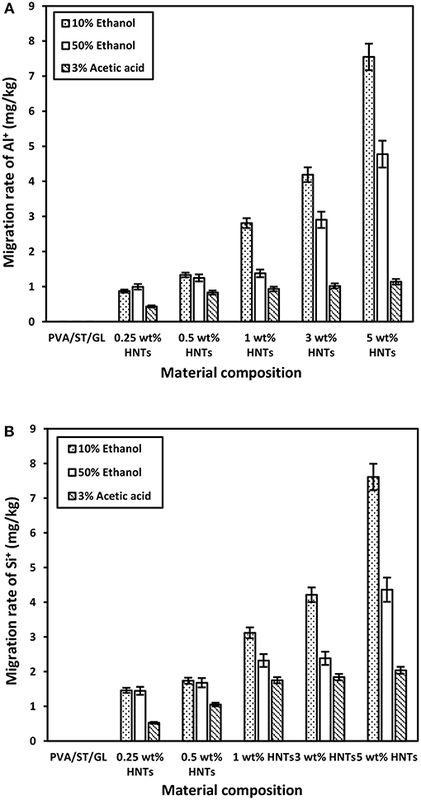 HNTs had significant effect on decreasing the overall migration rates of nanocomposite films in 10% ethanol food simulant as opposed to PVA/ST/GL blend films. Furthermore, the overall migration rates of nanocomposite films in 50% ethanol and 3% acidic food simulants were lower than the OML to meet stringent food safety requirements along with very low risk of nanoparticle migration of HNTs. Consequently, PVA/ST/GL/HNT nanocomposite films could be potentially used as versatile thin-film materials with high water resistance, good biodegradability, acceptable transparency and overall migration rates to target sustainable food packaging particularly for lipophilic and acidic foodstuffs. ZA did the experimental work and preparation, characterization, and property measurements of material samples. ZA and YD analyzed the data and jointly prepared the research manuscript. ZA would like to acknowledge the Higher Committee for Developing Education (HCDE) in Iraq to support a Ph. D scholarship at Curtin University. This study was undertaken using the SEM equipment (ARC LE0775553) with the technical assistance from Ms. Elaine Millers at Microscopy and Microanalysis Facility, the John deLaeter Centre, Curtin University. Additionally, migration tests were conducted with the aid of Mr. Andrew Chan at WA School of Mines: Minerals, Energy and Chemical Engineering, Curtin University. Azahari, N. A., Othman, N. N., and Ismail, H (2011). Biodegradation studies of polyvinyl alcohol/corn starch blend films in solid and solution media. J. Phys. Sci. 22, 15–31. European Union Commission Regulation (EU) No. 10 (2011). Commission regulation on plastic materials and articles intended to come into contact with food. Offic. J. Eur. Un. L 12, 1–89. Kamble, R., Ghag, M., Gaikawad, S., and Panda, B. K. (2012). Halloysite nanotubes and applications: a review. J. Adv. Sci. Res. 3, 25–29. Qiu, K., and Netravali, A. N. (2015). “Polyvinyl alcohol based biodegradable polymer nanocomposites,” in Biodegradable Polymers, eds C. C. Chu (New York, NY: Nova Science Publishers, Inc), 326–379. Rawtani, D., and Agrewal, Y. K. (2012). Multifarious applications of halloysite nanotubes: a review. Rev. Adv. Mater. Sci. 30, 282–295. Salam, H., Dong, Y., and Davies, I. (2015). “Development of biobased polymer/clay nanocomposites,” in Fillers and Reinforcements for Advanced Nanocomposites, eds Y. Dong, R. Umer, and A. Lau (Cambridge: Elsevier), 101–132. Sam, S. T., Nuradibah, M. A., Chin, K. M., and Hani, N. (2016). “Current application and challenges on packaging industry based on natural polymer blending,” in Natural Polymers-Industry Technques and Applications, ed O. Olatunji (London: Springer), 163–184. Simon, P., Chaudhry, Q., and Bakos, D. (2008). Migration of engineered nanoparticles from polymer packaging to food – a physicochemical view. J. Food. Nutr. Res. 47, 105–113. Sustainable Packaging Coalition. (2011). Definition-of-Sustainable-Packaging. Available online at: https://sustainablepackaging.org/wp-content/uploads/2017/09/Definition-of-Sustainable-Packaging.pdf (Accessed 1 October, 2011). Tanase, E. E., Popa, M. E., Rapa, M., and Popa, O. (2015). Preparation and characterization of biopolymer blends based on polyvinyl alcohol and starch. Roman. Biotechnol. Lett. 20, 10306–10315. Tully, J., Fakhrullin, R., and Lvov, Y. (2015). “Halloysite clay nanotube composites with sustained release of chemicals,” in Nanomaterials and Nanoarchitectures, eds M. Bardosova and T. Wagner (Dordrecht: Springer),87–118. Yuan, Y., and Lee, T. R. (2013). “Contact angle and wetting properties,” in Surface Science Techniques, eds G. Bracco and B. Holst (Berlin: Verlag Berlin Heidelberg; Springer), 3–34. Copyright © 2019 Abdullah and Dong. This is an open-access article distributed under the terms of the Creative Commons Attribution License (CC BY). The use, distribution or reproduction in other forums is permitted, provided the original author(s) and the copyright owner(s) are credited and that the original publication in this journal is cited, in accordance with accepted academic practice. No use, distribution or reproduction is permitted which does not comply with these terms.